My last morning in Texas. Monday was Labor Day. Lisa was kind enough to book me on a 1 pm flight out, so I didn't have to be up at the buttcrack of dawn. She and I had found a groove of getting up and having a cuppa cuppa outside, we called it the porch, but it was kind of like on a carport. The mornings were my favorite part of being in Texas, the sunlight would glow against the mountains, turning them almost a beautiful red, I posted a pic of that the other day, still I sat out there on my last morning, and I knew I'd miss that view. And these little yahoos. I spent most of the weekend, Not Thinking about how much I was going to miss them. By the last day, they were finally beginning to slightly annoy me. That made it easier to leave, I think. That and Lisa and I were trying really hard to not be sappy, it's easier for me to say goodbye knowing I'll see them over Spring Break for sure, and maybe even Christmas. But, I was beginning to miss my own special brand of crazy back home. Being away on Sunday when Chris was hurting was really hard on me. I wanted to get home to him. I even told them I was going to wake them up when I got home. I left a little sample of my love before I left. I painted the girls toenails. I painted Annie's on her birthday, and there was only the slightest hint of that glitter pink left, and Charlie was being so sweet too. Morning really is their best time. So I painted both of their toenails (sets of toenails anyway, sounds funny to say both, but you know what I mean). They were totally thrilled to have orange toes. I had picked orange because it struck me as perfect for deep south, little did I know, when we got down there the local university's colors are orange and blue (UTEP). So Orange is Perfectly Appropriate. However, these girls get BORED with waiting for their nails to dry. They're cute when they are bored. OK, they're cute for about 2 seconds before the crazy sets in, but they did it, let their nails dry. Only had to redo one of Charlie's, not bad for girls that aren't as girly girls as their Anty Cathy. We decided to head out for some exploring before going to the airport, and I walked the kids down to the tank on the corner. 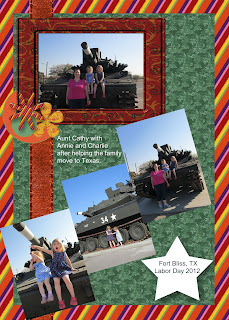 Yeah, there's a tank on the corner on base, not quite Every corner, but more than one, and Lisa has one two doors down. Right next to the church. HA HA HA! I did this speed scrap from pictures of the girls at the tank before we hit the road, doing a bit of exploring. I wanted to go "down to the river". I figured, if the Rio Grande was the river on the border, there would be some kind of scenic overlook. Apparently not. Juarez is so dangerous, that people shoot at people by the river, and there's a giant wall along most of it. So there's no scenic view of the river, but as we drove by on the highway, I got a smidge of a view. That's about it. It's really not safe to go near the border, or to cross it. James, as a member of the army, isn't allowed to cross. They're probably afraid the army would totally kick the asses of all those druggies, and ruin their 'business'. Well, after some highway cruising, we stopped for lunch at Whattaburger. My friend Jen, from the area, highly recommended it. They were quite yummy! Suddenly it was time to say goodbye. Too soon. Suddenly they were off, not exactly into the sunset, but off and I was in the airport alone. I didn't cry. Much. Got a little teary, but there was much checking in to do, security to get through, and trashy books to read. El Paso airport has free wifi. They are really nice. Now that was weird. I calculated the last time I was on a plane by myself was March of 2005, when I was popping to North Carolina once a month for a week for training on the lab sampling software I was trying to tailor for the county lab where I worked at the time. How insane those days were, I almost gave up my health and the health of my baby to get that project done. I don't regret walking out on the job, sometimes I miss the people, and making a difference to the masses through my work, but I'm making a difference right here. It was refreshing to sit on the plane alone, my only complaint is I wish I was a little bit smaller, to fit in the seats better. Our flight started out bumpy, but the rest of my trip was smooth. My sweet sister gave me a 1 1/2 hour layover in Atlanta, "just in case"...my gates were right next to each other. No problems at all. In fact, we got in about 10 minutes early, wahoo! All my boys were ready for me to come home. And I for them. Lisa and James had bought them some cute little Army Bears while we were at the P/X, and I went in when I got home, and gave them their bears. They both opened their eyes, looked at me, but they didn't see me. However, they got those bears. They woke up with those bears the next morning, they were so excited, they climbed in with me, and I had dueling sweetboys and sweetbears. Those bears haven't left their beds much except to be played with, since I came home. It was good to be home, with bears and boys alike.